Bible App for Kids: Now with Games! The best Bible App for Kids just got better. Today YouVersion and OneHope are thrilled to announce the biggest Bible App for Kids news since its debut almost 3 years ago. Our latest update (available now) introduces so many upgrades and new features, the Bible App for Kids feels like a brand-new app. Full-color icons tell your kids at a glance which stories they’ve already downloaded, while faded white icons show which ones they don’t have yet. 1After you’ve updated your app, the first time you tap on a story that features an activity you haven’t used before (such as Story Mixup), the app will prompt you to redownload that story to get the new content. Story Mixup helps your kids learn Bible stories. Story Mixup spreads out cards representing scenes from the Bible story your kids just experienced — but in random order.2 To play, they simply drag the cards from the table at the top of the screen to the drawer along the bottom, arranging the scenes into the same order as they happened in the story. When they put their last card in the drawer, if any are out of sequence, those cards jump back to the table for them to try again. (Cards they’ve already placed in the correct slot stay put.) When they get all the cards in the right order, confetti and music celebrate their achievement! Your kids will love Story Mixup because it’s fun. You’ll love it because it locks Bible stories into their memory by helping them understand what happened when. 2Story Mixup is available for In the Beginning, The First Sin, The Walls Go Up, It Is Finished, and God’s Good News. We’ll be introducing more new games and activities for other stories in the coming months. Find out first… what’s coming next. Story Mixup is only the first of four brand-new games and activities coming to the Bible App for Kids. We’ll tell you more about each one when they launch. And, if you follow Bible App for Kids on our Facebook, Twitter, or Instagram, you’ll be among the first to hear about these and other new features as soon as they become available! Four years ago the Bible App had been installed on over 80 million devices. And as more and more people continued to discover it, we wondered: What if kids had their own Bible App? Together with our friends at OneHope, we envisioned a fun app that could introduce kids to the big stories of the Bible. 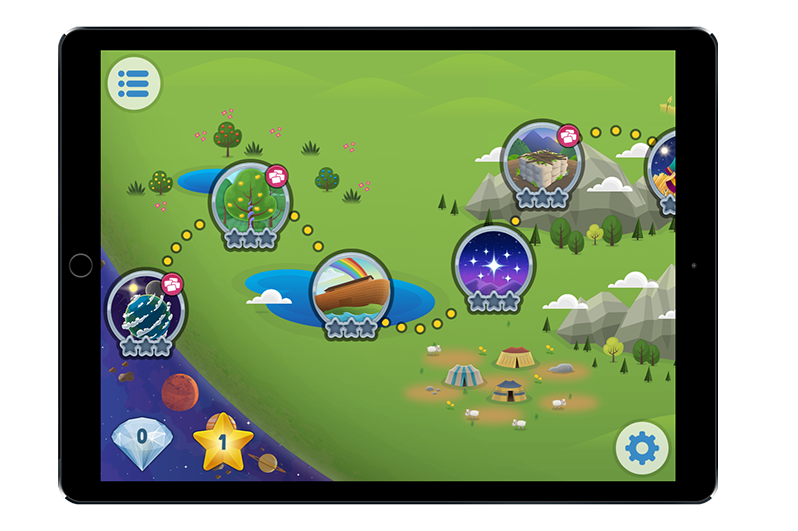 The Bible App for Kids was born, featuring touch-activated animations and engaging content. Today the Bible App for Kids offers all 40 of those original stories we planned, plus a bonus story! Already available in 19 languages — with more still to come — the Bible App for Kids is being enjoyed by children all over the world. Installed on over 12 million devices, the Bible App for Kids is always completely free. Previous PostPrevious The Bible App for Kids is Now Available in Thai and Urdu!